At our member potluck on June 1 we had some great dishes shared with us featuring vegetables from Red Moon Farm’s CSA boxes. 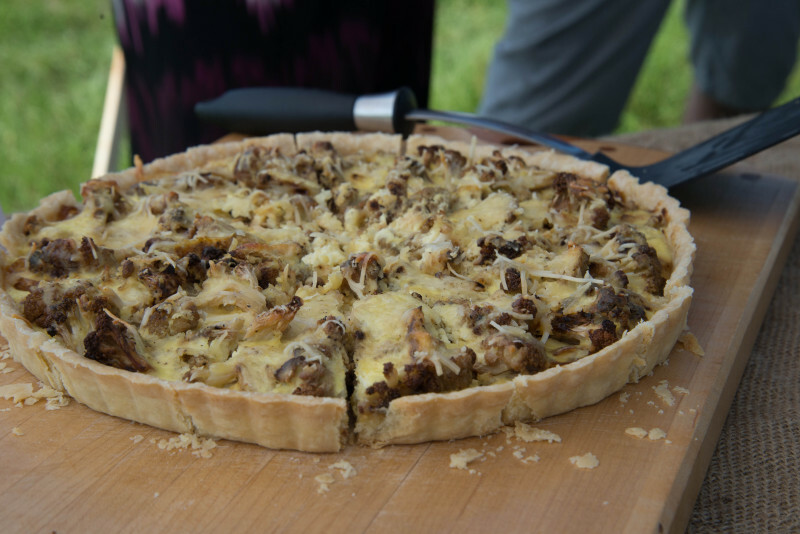 This was our own offering: a messy tart made with caramelized onions, roasted cauliflower and plenty of cheese. Eat up! Toss the cauliflower with a little of the olive oil and roast on a rimmed baking sheet at 425 for about an hour, or until beginning to brown. Turn every 15 to 20 minutes. Cool, slice, then toss with truffle oil. Turn the oven down to 350. Heat 2 T olive oil in a metal skillet (don’t use non-stick) and toss in the sliced onions. Cook on a medium heat for about 40 minutes or until a deep golden brown. Stir frequently with a flat edged spatula, scraping the bottom to get the good stuff. Meanwhile, prepare the crust. Set out the butter and allow it to soften just a little. You want it to still be cold but workable. Measure your flower and salt into a medium sized bowl and using a pastry cutter, cut the butter into the flour until it’s in very small crumbles. Add 3 tablespoons of frigid cold water, and cut it in with the pastry cutter, scraping the cutter as needed. You might need a fourth tablespoon of water, and maybe even just a teaspoon more. Add just enough water to bring the dough together. To keep your crust flaky, use only the pastry cutter and press any remaining crumbs together. Do not kneed the dough together or your crust will be tough. Wrap in plastic wrap and refrigerate, or use immediately. These steps above can all be done the day before to save lots of time the day of. Store each ingredient separately, sealed tightly in the fridge. On a sheet of waxed paper, or parchment, roll out your crust, using plenty of flour on the paper and roller to keep it from sticking. Press into a tart pan and prick the bottom with a fork. Bake at 350 for 20 minutes or until set but not beginning to brown. Brush bottom of crust with mustard and spread evenly with onions and cauliflower. Whisk eggs, ricotta, yogurt, pepper, salt, and nutmeg and pour over the tart. Sprinkle with Parmesan. Bake at 350 for about 40 minutes until set and the cheese and crust begin to turn golden. Thanks for this recipe. That was a delicious tart. Please, Jessica, would you share your technique for the Rustic Peach Tart with Blue Cheese, also from your Member Potluck. That was outstanding and we’d love to do one right now with summer’s peaches at this prime stage for flavor and sweetness.